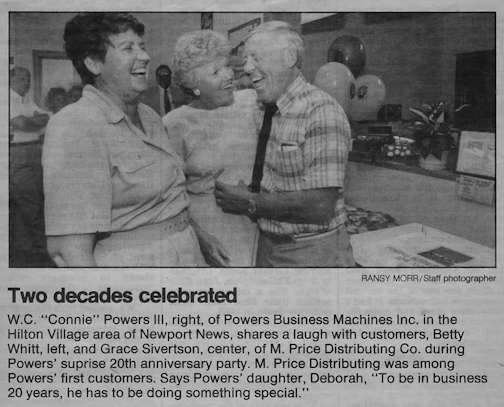 Connie Powers founded Powers Business Machines in 1970 with vision of providing customers what want, when they want it. The idea behind the business came from the simple desire to help people. He believes strongly in his philosophy that service comes before sales. 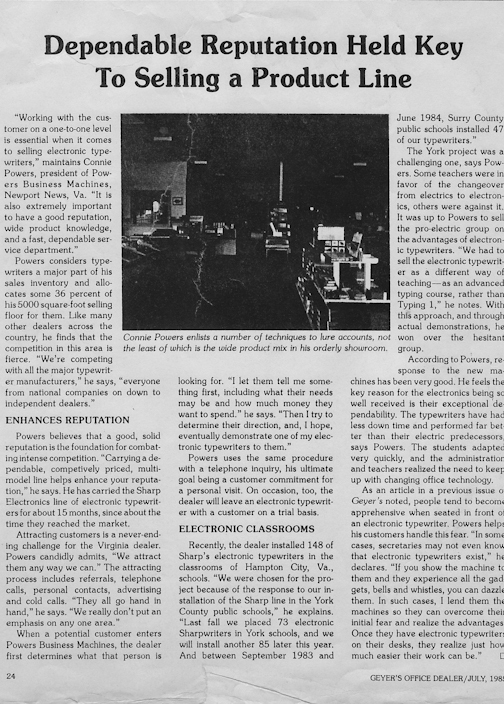 Over a forty-five year history, his business has been able to grow with the changing times, and he is still helping business of all sizes achieve their goals by providing them quality products at competitive prices. The sales team, service technicians, and the management operate together to provide the best service possible. Every one of them is prepared and eager to assist you with all your office supply, equipment, furniture, or repair needs. 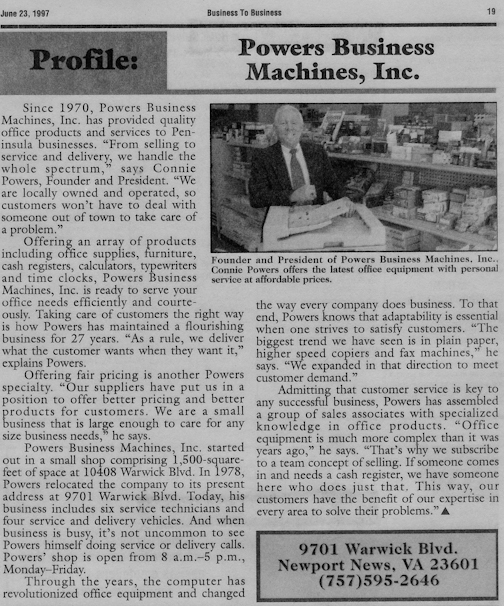 Powers may be a small business, but it is able to care for all office needs for any size business. Connie Powers is a Vietnam Veteran, and was honorable discharged from the U.S. Army in 1970. He is passionate about sports and has been a member of the Peninsula Sports Club since 1987, and served on the Board of Directors for 13 years. During his time with The Peninsula Sports Club, Connie has been awarded with a Special Achievement Award, The Charles Karmosky Award and the Presidents Award. Connie was the Peninsula wrestling Official/Commissioner for 30 years, and received an Outstanding Award in 1999. He has also been awarded the Peninsula District Wrestling Appreciation Award and the Virginia Interscholastic Athletic Administrators Award. In 2003 He received the Lifetime Service to Wrestling Award and was inducted into the National Wrestling Hall of Fame. Currently, he serves as a Board Member for the Peninsula Sports Club Scholarship and is a member of the First Baptist Church in Newport News. 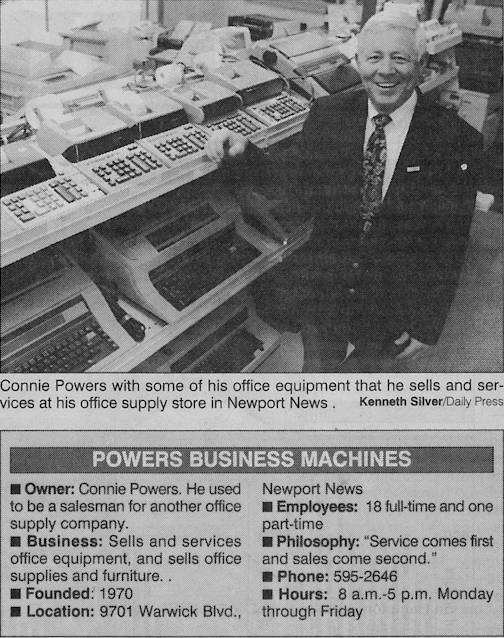 Connie is a member of the Office Supply Dealer Association, as well as the National Office Dealers Association, and served as President and as Board Member on Local, State, and National Levels. 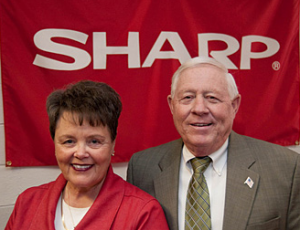 Sharp Electronics Corporation has awarded Powers Business Machines the Recognition Award for Performance and Representation as a Sharp only dealer for Fax machines and Copiers, and the Sharp-Hyakuman Kai Award for outstanding sales and achievements. Connie is also a Board member and Committee member for the City of Newport News Green Foundation. – The Recognition Award for Performance and Representation as a Sharp only dealer for Fax machines and Copiers.